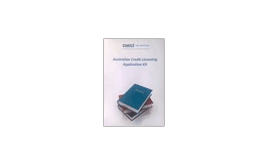 If you are a self-sufficient business person and prefer to create your own policies required for your Australian Credit Licence, QED Risk Services' Australian Credit Licence Application Kit is the perfect partner for you. The Kit will provide you with all the information you need to successfully submit your own ACL application with ASIC, particularly the templates for creating the required policies and procedures that ASIC will likely ask for from you during the application process. These documents form part of your ASIC application for your Licence, however they enable you to gain the maximum leverage from the regulatory requirements and add value to your business. The application kit also includes our ACL Smooth Application Guide (can be purchased separately). The Kit can save you over 80 hours of time to develop your policies to the standard ASIC expects for Credit Licensees. We have found over the years that brokers that have used this Kit have got themselves to the same place as they would have if QED Risk Services had performed their full ACL service for them. However, you do have to take into account the time value of you completing these documents yourself, bearing in mind that QED Risk Services can do it all for you.